You know how, after reading a disappointing YA novel, we list a bunch of things we wish the author had done…well, Gayle Forman actually does them. 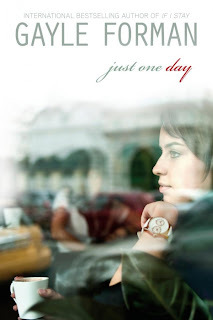 Just One Day is a coming-of-age story. It’s about a girl who meets a boy on a train. She abandons her plans and they spend a day together in Paris. In one day, the girl lets slip all of her inhibitions and takes chances; confesses thoughts that have never until now fully made themselves known; and begins to hope for a future she never realized she wanted. And then it is taken away from her. At the brink of a new beginning, it is ended. The girl leaves a lot of herself in Paris, in that one night, with that boy. The struggle now is to learn to live on, to move on. Only she can’t. Forman sculpts compelling characters. I say this because Allyson is an ordinary girl. A little scared, a little sheltered, a little unlived. But, like she says, and like so many of us, she feels there is this other girl inside, another girl who is brave and outspoken, a girl who dares. Only she is trapped somehow. Like so many of us, she wants to set her free. And this is what Forman captures for us to witness: Allyson’s expansion, the moment she finally reaches out, stretches out, to touch life. Allyson’s relationships with other characters are developed. Forman is able to grasp and portray the awkward and sometimes regretful consequences of becoming an adult. Allyson’s strained and frustrated dynamic with her mother, which at times I thought was a little excessive but then again maybe not, after you read the reasons behind her overbearningness. Her friendship with childhood best friend Melanie is beautiful and bittersweet; how friends grow, change and drift away but also how they may drift back. And, of course, her relationship with herself. They are well-written. They all hit the chord of truth. Her relationship with Willem. It is short and romantic and I missed him when he was gone. There is a little more mystery than I appreciated, too many half smiles for answers and not enough actual explanations. But he had moments, moments when he’d do his thing and observe then say something and I’d think yes, I want those words said to me. What I love most is that their “thing” is about substantial things. They meditate about life, love, and how they see themselves. They talk to each other. They listen to each other. And they mean it. To be fair, I’m talking about the bare bones here. It isn’t entirely free of flaws. For example, I thought little by little, this became akin to a scene of a parade in a romantic comedy — when the main character decides to brave the world and all her friends clap and march by her side in support with big goofy grins on their faces. The sudden momentum and happy “accidents” Allyson gathers near the end seemed mildly preposterous. Mildly. Allyson’s story isn’t special (other than the fact that her self-discovery unfolds in Paris). It is simply about a girl trying to find herself. About a girl who wakes up one day and realizes she wants more, more, more. But she doesn’t know how. How do you make friends? How do you just close your eyes, pick a place and go? How do you just take what you want instead of waiting it to be offered to you? How do you even figure out what you want in the first place? Familiar questions. We ask ourselves the same. And we all have whims and fancies, we have imaginations and daydreams. But then responsibilities and duties get in the way. What this book offers is a rejuvenation. That light bounce in our step, that gentle push on our back. That soft voice reminding us to keep looking for our answers. I’m still unsure if I want to read this book. While I love Forman, I’m worried as to how I’ll take to this story (and the plot line that been done before) and the MC who sounds a lot like me but…I don’t know. Conflicted feelings obviously! Great review, though! I really think that I ought to get to reading this book. Especially in time to read the companion book when it’s released in the fall. I love Gayle’s If I Stay and Where She Went. Her writing style and ability to depict real human emotion are amazing. Excellent and compelling review, even with the 3.5 rating. Even if it has 3.5 it seems a interesting book! I will download it soon to read it! you guys are pretty cool at this! Great review! I keep going back and forth on this one. I have it on my Kindle, I just never seem to choose it as my next read. Thank you for your thoughts… I think I may give it a try some time soon. I haven’t read anything by Forman, but I’ve nearly bought this book at least ten times. Always reconsider and decide against it, though. Not really sure why, but I think your review may have swayed me in the other direction this time. The happy coincidences might prove problematic, but at least I know they’re there going into it. Even though I thought it wasn’t quite as good as her other books, I’m with you all the way on Just One Day. There’s something about Forman’s ability to capture those questions/truths about life and our own unexplored passions. I too hope that some of Willem’s secrets are expanded on in the sequel, or at least given some weight. I liked him, and I liked that their conversations were not superficial, but I also wasn’t a huge fan of those half smiles. Wow, your review is AMAZING. I agreed with you on everything. It was a great self-discovery story, but there were things that made me guffawed. I am excited to read the second one though! Lovely review. I’m so excited to read this one, even if it doesn’t live up to expectations, I love GF. Heard so many great things about this book!! Loved your review! It makes me a bit hesitant to read the book just because it’s almost too ordinary, but that sometimes can be really special too. Beautifully written! Yes, it’s not a new story or even a very original one. But the way Forman writes it is like magic to me! I loved this one, particularly because it allowed me (to some extent) to relive moments when I too have felt the way Allyson did. I’m one of the few people that didn’t fall head over heels for this one. I didn’t like Willem at first (I did by the end) and I thought once Allyson got home most of her year was consumed by him instead of learning anything from her experiences. I liked it but I didn’t love it. Wonderful review, K. While I’m a big fan of Ms. Forman, I’ve been told that it’s probably a good idea to wait for the next one. What’s your take? Fantastic review. This seems like one of those books I want to read for me. Just because I’m dealing with these kind of thoughts, especially since I’m debating leaving home to go to University. Your review really resonated with me. How do you make friends? How do you just close your eyes, pick a place and go? How do you just take what you want instead of waiting it to be offered to you? How do you even figure out what you want in the first place? This is such a well-thought review, lady! I’ve been on the fence about this one and am often pretty weary of contemporary romance, if only because they lack a sense of realness and authenticity. Aside from the overly whimsical setting, it sounds like the characters and their experiences are beyond authentic. I like it when I can really relate to a character and the hardships that they’re going through. There isn’t always a happily ever after and as hard as that may be to read, sometimes it’s the most satifying kind of ending. Yes Nikki. I agree with you about contemporaries being a bit superflous haha. But there’s nothing here too crazy other than a bunch of kids making traveling as though it were that easy…hope you like it. This really is such a gorgeous review, K. I must admit, I’m super impressed that you were able convey your thoughts in such a perfect manner. But anyways, I have to agree with you on basically everything in your review. At its core, this really is a story of self-discovery. It’s that special and it’s that unspecial. The reason I think (personally) this book has been a bit over-hyped is because everyone can relate so well and goes a bit crazy, without stepping back to take a look at the story. But I really did enjoy it, even with its faults. It’s a great book, filled with exploration- of both kinds. Thank you Anneqah :) When you say it special and unspecial at the same time, I thought that was perfect. So general and over-asked yet it is the thread that runs through all of us. I loved Forman’s previous books, but I’m struggling to get through this one, K. I can’t figure out whether it’s just that I don’t like Allyson for whatever reason – though I can relate to her – or whether it’s the romance that’s bugging me. Well, some books just aren’t for us, I suppose. I didn’t struggle myself though it is my least favourite of her books. I love those movies!! They defintely had many similarities…they even slept in a park! Have you seen Before Midnight? Incredible! Great review! I have never read one of Foreman’s books because I’m not a huge fan of contemporary book. I did hear that If I Stay was great but I’m not sure if it would appeal to me! Oh I really hope you give her a chance. She writes books that just hit you in the heart. Maybe read this first then save her If I Stay series for last. They’re the best. To be quite honest I think it could’ve occured anywhere. It was just the feeling of adventure and being brave and saying yes to life. I have hears some really good things about this book. I will have to give it a try. Great review! Phenomenal review, K! I’ve heard so many amazing things about this book of Gayle’s, your lovely review being one of them. I love what you said about Gayle being the type of author who actually takes criticism and uses it to better her books- that’s the mark of a dedicated writer! No wonder her books are so famous and beloved. Thank you. I don’t know if its necessarily criticsm rather that Forman is just a really good writer haha! As for Willem and Allyson, I definitely wanted to know more of Willem but I suppose that’s the point since the next book is his perspective. They’re not quite Mia and Adam sadly. Oh those two! I agree that her other series is better, but I still enjoyed this so much! It captured that spirit of adventure and possibility that I felt was missing in WANDERLUST, a book a lot of people enjoyed but I felt wasn’t all that exciting. It’s true what you say re: the Paris setting, though. I thought it was interesting to see how dramatically the tone of the story changed after she got home and had to face reality, but I rather liked that–we all face that feeling of readjustment after being away from our own home for awhile, and I thought she pulled off the two halves pretty well considering. Not a huge fan of that ending though, hah. But not too much longer to wait for the sequel. After reading I just wanted to do that close your eyes and point on the map thing they do. Actually, I wish more that I lived 2 hrs away from Paris! Grr North America, grr! And the readjustment phase — that’s the word!! Forman did a good job. I felt Allyson’s need for closure. Can’t wait for the next book. I loved this review! I have read all of Gale Forman’s books! She is amazing! Wow, K, that review was beautifully written. Stunning. Especially that last paragraph. I will be looking for it in a bookstore, thank to your review. The summary didn’t really feel like it had much in terms of plot, but I’ve reconsidered. Aw, thank you Shannelle. I’m so happy I was able to convince you! That’s all a blogger wants, right? To spread good stories…and warn against bad ones ;) haha! I really didn’t like this book-I was so bored with Allyson for much of the book. It was only once she started her Shakespeare class and doing stuff that I got interested…and it took way too long to reach that point! I really liked the first part, actually. It was the adventure portion of the book. Sorry it wasn’t as exciting for you. Hopefully Willem’s story will change your opinion. Thanks, Keertana. I was really happy to see that, even though Allyson was boy-crazy enough to travel to Paris for a guy, it was still about self-discovery. And when she did find him, it was more for closure, really. Because that’s the worst kind of hang-up isn’t it? haha! My favorite part of the book might’ve been her roommates, and how their relationship changed when Allyson opened up to the fact they’d been trying to make friends with her. Yes, I was impressed by her interactions with the other characters. I especially liked her relationship with Melanie — the growing up and drifting away that happens when you start going your own way :( Bittersweet. Exactly! Loved your review! I can not wait to read the next book! I want it soooo bad! I’m sorry you didn’t enjoy this one quite as much as you had hoped. You’ve written a wonderful review, however, and I hope get some of what you got out of it when I get around to reading it. Thanks, Brandy. I definitely like her other series more but this wasn’t by any means a bad book. Still glad I read it. Still great writing. I hate happy coincidences. They’re just thrown there to make things easier :/ They frustrate me a lot. I’m about to pick this book up this afternoon to read myself, so I’m curious if I’ll love it the way many others do or if I’ll have similar opinions to you. I agree, Lili. In the end it got a little hard to believe. But still worth the read. More than anything I think its about spontaneity but Forman leans toward fate or serendipity. Enjoy! Beautifully written review! I really enjoy Gayle Forman’s writing and if I’ve put off reading this book, it’s only because I’m afraid it will make me want to hop on the next plane to Paris! Thanks, Kate. I think it will make you want to travel, not specifically to Paris, however. She has a different angle of Paris here, not the touristy Paris, but the nooks and crannies of Paris. Which I think was a nice touch.